There is something that stings about John Maclean's directorial debut that goes further than the typical resonance a western might have with me. Raised in a time when the western had become something of a genre of tropes and little more, Slow West is eager to create a film not of the place in time that has been crafted by nostalgia, but more in the vein of the intense harshness this location at this period in time actually represented. The West at the turn of the century was not for the faint of heart and Maclean is sure to hit this point hard. He is clearly messing with the aforementioned tropes that typically made up large portions of westerns made after the 1950's, but even further than this he brings a different aesthetic than what we typically expect from westerns which inadvertently throws ones expectations for a loop resulting in a film that is strangely engaging, darkly humorous and overall oddly fascinating. 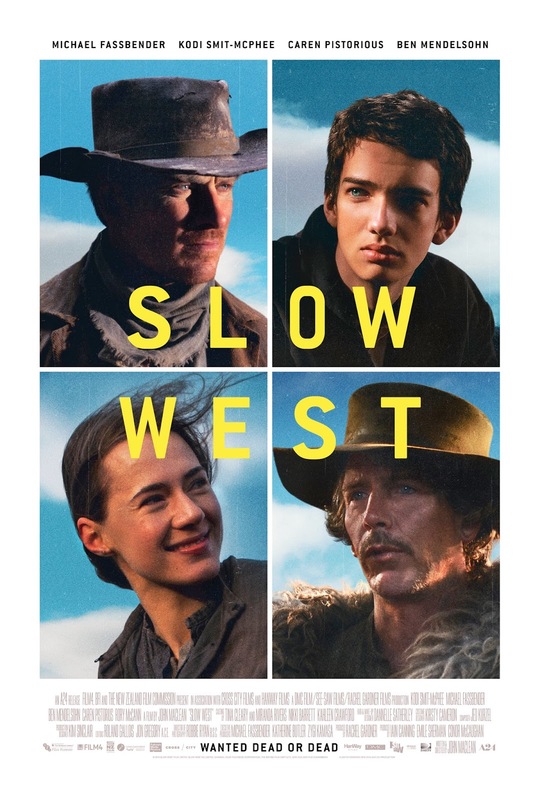 Everything about Slow West feels rather slight, as if any character or any scenario might fall apart or render insignificant at any point, but as the film continues to play out and Maclean's script allows each characters arc to naturally unfold it reveals a very specific set of goals. That is almost to say the film has something substantial to say when in reality it is more about making a statement or observation concerning a time that happened not so long ago with people we hardly recognize. Of course, I have no real idea of what Maclean's intentions were with the film or what drove him to write a western, much less make it his first directorial effort, but what effectively comes from his story is the grand significance of our shifting humanity. At the tail end of the film, and this isn't to spoil anything, there is a montage or recap of every single life that has been taken throughout the course of the film. It isn't to drive home how fragile life is, but more to reinforce the nature and brutality of the time. Life wasn't worth as much back then, which is good for us who can now sit back and call this entertainment, but it's something worth noting in our current state. It's a rather extraneous concept when given the content of the film, but Slow West is just weird enough that it kind of makes sense. 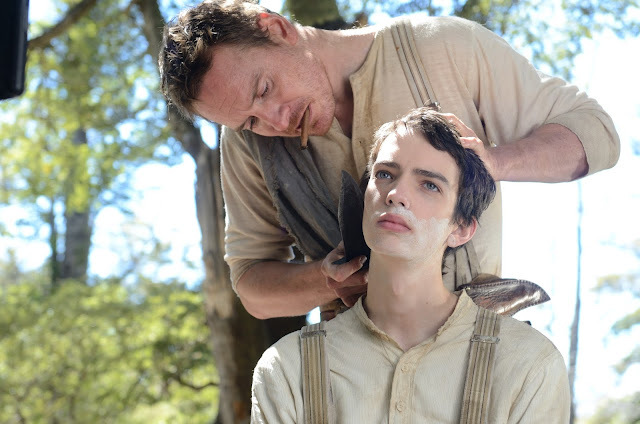 Silas Selleck (Michael Fassbender) gives Jay Cavendish (Kodi Smit-McPhee) a close shave. What keeps us from dying? It is one of the many questions pondered by Jay as he attempts to better acquaint himself with his guide. It is a pointed line, but one that is dismissed by Selleck so as to avoid the depths of any real conversation where he might have to consider things too hard. There is a bigger idea to be withdrawn from these characteristics that both Fassbender and Smit-McPhee exude, but the film itself makes its broad ideas about these contrasting mentalities. The genre of the western is meant to be simple, meant to be straightforward as the story is here while Jay's introspective inquiries are meant to delve into the societal norms of the time and why this type of existence was accepted as the norm and how those who lived outside of having to face tough daily deeds were able to live with themselves or how those on the front lines were able to lift such deeds from their conscious so as to not drive themselves mad. Both Smit-McPhee and Fassbender are adequate in what their roles require from them with each taking on their different end of the intellectual spectrum in strides. Supporting players in the form of Ben Mendelsohn as gang leader Payne, who once employed the skills of Selleck, is as cruel as ever in another villainous role he always revels in while Pistorius is quietly moving in her third act stand as is her right hand man, Kotori (Kalani Queypo). The film is also slight in its running time as it barely reaches and hour and twenty minutes, but in this time it nicely paces itself to set the audience up for a final showdown that is packed with tension and humor while effectively fulfilling a promise thought all too easy to ensure by the hunters of the film. Teaching that there is more to life than survival, Slow West is presented in a sublime fashion despite its content being anything but grand or beautiful. It is a slow burn of sorts, but one worth taking note of if not taking joy from.